A recent search on Amazon for “MTM Special Ops” results in several other military-style watches. If Amazon doesn’t sell a specific product I’m looking for, should it simply tell me “Sorry, nothing here” or should it bring up a slate of other, possibly similar, competing products? To one high-end watchmaker that’s been involved in a four-year legal battle with Amazon, these questionable search results aren’t just an annoyance but constitute trademark infringement. And yesterday, a federal appeals panel said Amazon must face this trademark complaint in court. In a 2-1 opinion [PDF], the San Francisco-based 9th Circuit Court of Appeals overturned a lower court ruling that Amazon would not have to go to trial over a trademark dispute with watchmaker Multi Time Machine Inc.
MTM first filed the lawsuit against Amazon back in 2011, claiming the retailer’s search results cause confusion for its potential buyers. MTM sells its watches directly to consumers and not through other retailers, including Amazon. 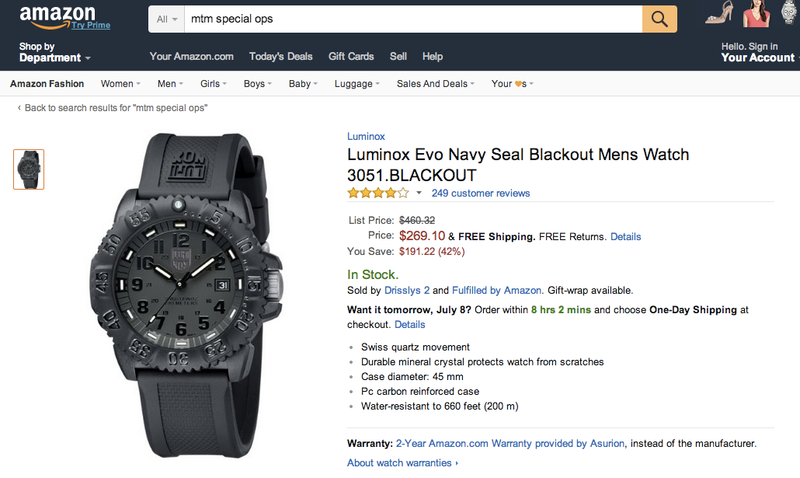 However, MTM’s suit claims that when an individual searches for the military-style watch on Amazon the results turn up a list that includes several trademarked “MTM Special Ops” references in the search field and immediately below the search field, a list of similar products, and no indication that the online retailer doesn’t actually carry the products. MTM asserts that even if shoppers knew they weren’t purchasing from the company, the list generated by Amazon could cause “initial interest confusion,” a point the appeals court’s opinion agreed with. In reversing the lower court’s decision, the appeals panel disagreed with Amazon’s defense that using “MTM Special Ops” as a search on the site didn’t constitute “use in commerce,” which means the bona fide use of a mark in the ordinary course of trade. Following the federal appeals court decision, the suit returns to the district court in Los Angeles.